Stillness is always with us. When it is discovered, it is never lost; if it is attained, it does not stay. Meditation upon anything other than the nature of atma will simply result in mental steadiness. Meditation upon the nature of atma alone (contemplation) will result in its ascertained vision, which itself is moksha. Karma yoga without jnanam (knowledge) will be incomplete. Jnanam without karma yoga will be impossible. What is perceptible is not real. What is real is not perceptible. 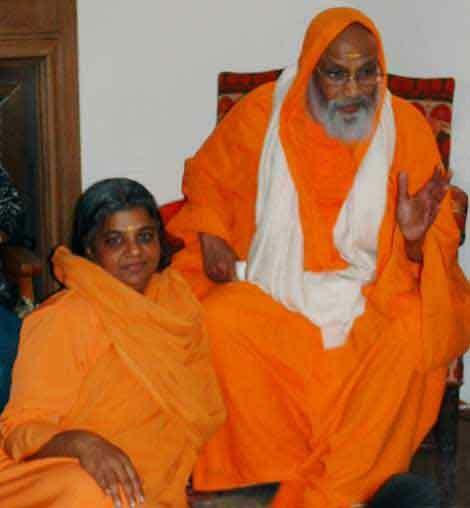 It has been famously said: “By their fruits you shall know them.” This being so, the discourses of Pujya Swamini Atmaprakashanandaji show the greatness of her guru, Parama Pujya Swami Dayananda Saraswati. Her flawless, systematic knowledge of traditional advaita Vedanta and its methods enables her to throw light on even the subtlest points with ease, providing complete clarity of understanding — a clarity confirmed by her guru. Since first discoursing on Vedanta here in the UK in 2004, Swaminiji has returned many times — creating, in the process, a large library of talks — and has also spoken in Holland, Germany, the Middle East, USA, India and Australia. 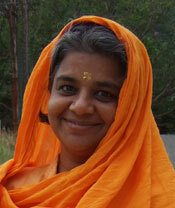 She is fluent in English, Sanskrit, Tamil, and Telugu, and additionally guides ceremonies and worship within the Vedic tradition. Swaminiji speaks on Bhaja Govindam. Its nature and purpose explained. Samadhi is not liberation; jnanam is. An extract from talks on Drig Drishya Viveka (v19-20).